New Age travellers occupying the old Sheffield Ski Village site have been taken to court by the council who want them moved on for a new development. A group of New Age travellers has lived at the site since the ski centre closed after being destroyed in a large fire. Since the blaze in 2012 the site has been left alone by developers and Sheffield Council. However, an eviction notice was given in January to the 29 New Age travellers living there ahead of a planned major new project costing £22.5 million. It will include a new ski centre. The eviction hearing started at the Sheffield Civil Court on Monday 24th September. Since the fire in 2012 that closed the site there have been a number of further fires. Each has been thought to have been caused by arson. But on Wednesday 26th September, the Sheffield Telegraph reported a new development that emerged during the court hearing. Roy Harrington, a traveller living near the former Sheffield Ski Village, claimed the fires may be due to methane leaking from a former landfill site. "I am not against your plans but did the ski slope not fail because of a lack of visitors and access?" he also stated at the hearing, according to the newspaper. "I know there are kids that mess about but I have seen fires kick off there and there are no kids. "Possibly, the whole ski slope buring down was the methane leaking out of the tip - I think that's possible," he continued. 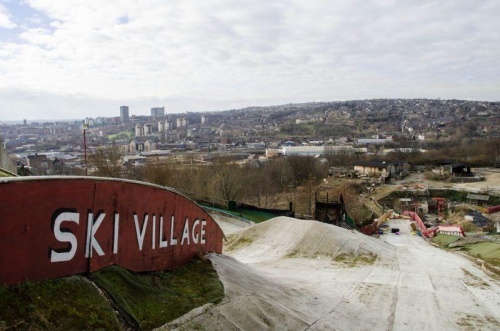 Sheffield Ski Village was once one of the biggest dry ski slopes of its kind in the UK and Europe. It's where the British Olympic freestyle skier and X-Games champion James 'Woodsy' Woods started out. EXTREME Destinations is the company that wants to spend £22.5m to rebuild the derelict site into a new sports area. As well as a ski centre it is planning to include an outdoor mountain bike track, an indoor climbing wall, eating and drinking facilities and accommodation. The judge at the hearing, His Honour Graham Robinson, was also told that the council has yet to find an alternative travellers' site. The travellers are reported to be in favour of the new development but want to continue to occupy a part of the land nearby as they did before it closed. "We want an ecologically-sustainable travellers' site for future travellers as well as us," Wayne Atkinson, a music teacher who's lived there for five years, is reported in the Sheffield Telegraph as saying. "I'm proud to be a citizen of Sheffield and to contribute to society. "We're not separate from the community, we're part of the community." The court case is continuing.